Subscribe to the Land Rover Insider for Pricing Updates, Shopping Tips, Latest News and More! By signing up you are eligible for exciting deals, promotions and sweepstakes. Jaguar is trialing a scheme that sees aluminum taken from its old cars recycled to make components for new models. The Reality programe is part of Jaguar Land Rover’s plan to develop a "closed-loop’ aluminum strategy whereby the lightweight metal from old vehicles would be re-used in next-generation models. Eventually, such a scheme could see the company dramatically reduce its need for new aluminium, as well as reduce carbon dioxide emissions. The British brand has already reduced its manufacturing operation’s CO2 output by 46 percent per vehicle produced, and although the 180,000 tons of aluminum it consumes every year is small fry compared with the 80 million tons produced, it wants to cut its use of virgin aluminium. At present, the Reality team is being tested on early, pre-production examples of the I-Pace, which have their batteries removed before being broken up and the metal sorted. Once it is separated out, the aluminium can then be melted down and turned into parts for new Jaguar Land Rover (JLR) models. Scientists at Brunel University then test the new components to ensure they are safe and strong enough to be used in car body panels. Aluminium recycling is nothing new. It’s one of the most widely recycled metals on the planet, with around 75 percent of all the aluminium ever made still being in circulation, and Jaguar is already heavily involved. Since 2013, the company has given around 300,000 tonnes of old metal a new lease of life in its aluminium vehicle architecture. The XE sedan, for example, uses a "significant amount" of recycled aluminium in its body structure, and the car was also the first in the world to use aluminum alloy grade RC5754, which contains up to 75 percent recycled aluminium, in its body panels. Eventually, JLR plans to use retired fleet cars to source its aluminium, recovering, de-polluting and shredding cars on an industrial scale. This, the Tata-owned firm says, would make the use of its own recycled metal viable for the business. Gaëlle Guillaume, lead project manager for the Reality program at Jaguar Land Rover, said: “More than a million cars are crushed every year in the U.K. and this pioneering project affords us a real opportunity to give some of them a second life. Aluminium is a valuable material and a key component in our manufacturing process and as such we’re committed to ensuring our use of it is as responsible as possible." Whitley, UK, 2nd April 2019: Jaguar Land Rover is developing the next phase of its aluminium closed loop strategy with an innovative recycling initiative to transform the vehicles of today into the cars of tomorrow. The REALITY project aims to recover aluminium from existing Jaguar and Land Rover vehicles and reform it into a new high-grade aluminium to create new vehicles. The process is currently being tested on early, pre-production Jaguar I-PACE prototypes which have had their batteries safely removed. 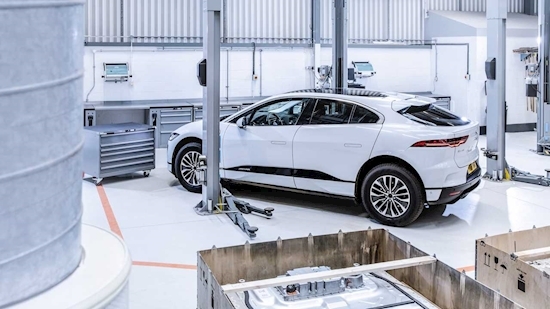 These batteries enter into their own second-life process which Jaguar Land Rover is developing while the scrap from the vehicles is sorted into various materials using high-tech sensors by Axion. Once separated, the aluminium scrap is melted and reformed. When operating at full capacity, REALITY is expected to reduce the CO2 impact of production while reducing the amount of virgin aluminium required to produce vehicles. Jaguar Land Rover has already reduced its global vehicle manufacturing operating CO2 by 46 per cent per vehicle and remains committed to an ongoing decarbonisation process. The pioneering project, co-funded by Innovate UK, is helping Jaguar Land Rover extend its closed loop aluminium economy. Between September 2013 and January 2019, around 300,000 tonnes of closed-loop scrap have been processed back into the brand’s lightweight aluminium intensive architecture, across all vehicle lines including XE. In 2014, Jaguar XE was the first vehicle in the world to use aluminium alloy grade RC5754 for its body panels, which contains up to 75 per cent recycled aluminium. Half of the XE body structure is made of aluminium alloy grades that contain an important amount of recycled aluminium content - made possible by a closed-loop manufacturing system at our UK and Slovakia facilities. As part of an ACES future, there will be an increased opportunity for recycling through the REALITY project, as Jaguar Land Rover will be able to plan for the retirement of large shared fleets. This will enable the company to engineer closed loop recycling into tight production schedules, as the vehicles can be recovered, de-polluted and shredded en masse – making a viable business case for using the company’s recycled aluminium within its own facilities. Jaguar Land Rover currently uses 180,000 tonnes of aluminium per year - a small percentage of the 80 million tonnes produced globally each year. It is already one of the most widely recycled materials with 75 per cent of all aluminium ever produced still in circulation. The recycled aluminium is being put through its paces by Brunel University scientists, who have conducted strength tests and graded its purity to ensure it meets the required mechanical standards to be used in body panels right across the Jaguar and Land Rover ranges.